The 3G4G Blog: Gigabit LTE? 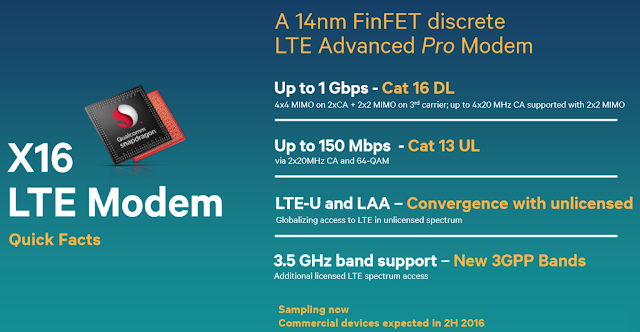 Last year Qualcomm announced the X16 LTE modem that was capable of up to 1Gbps, category 16 in DL and Cat 13 (150 Mbps) in UL. See my last post on UE categories here. 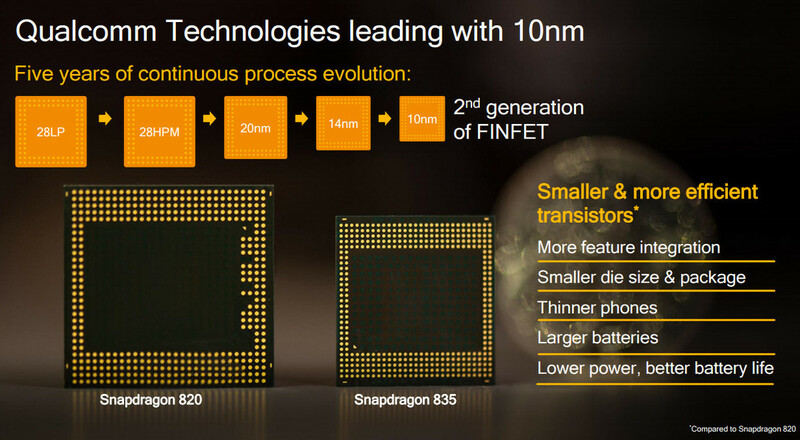 Early January, it announced Snapdragon 835 at CES that looks impressive. Android central says "On the connectivity side of things, there's the Snapdragon X16 LTE modem, which enables Category 16 LTE download speeds that go up to one gigabit per second. For uploads, there's a Category 13 modem that lets you upload at 150MB/sec. 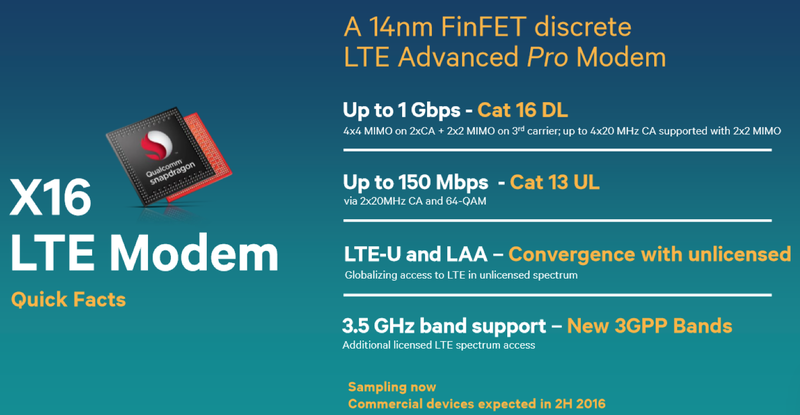 For Wi-Fi, Qualcomm is offering an integrated 2x2 802.11ac Wave-2 solution along with an 802.11ad multi-gigabit Wi-Fi module that tops out at 4.6Gb/sec. The 835 will consume up to 60% less power while on Wi-Fi." Technology purists would know that LTE, which is widely referred to as 4G, was in fact pre-4G or as some preferred to call it, 3.9G. New UE categories were introduced in Rel-10 to make LTE into LTE-Advanced with top speeds of 3Gbps. This way, the ITU requirements for a technology to be considered 4G (IMT-Advanced) was satisfied. LTE-A was already Gigabit capable in theory but in practice we had been seeing peak speeds of up to 600Mbps until recently. With this off my chest, lets look at what announcements are being made. Before that, you may want to revisit what 4.5G or LTE-Advanced Pro is here. Qualcomm, Telstra, Ericsson and NETGEAR Announce World’s First Gigabit Class LTE Mobile Device and Gigabit-Ready Network. Gigabit Class LTE download speeds are achieved through a combination of 3x carrier aggregation, 4x4 MIMO on two aggregated carriers plus 2x2 MIMO on the third carrier, and 256-QAM higher order modulation. Telenet in partnership with ZTE have achieved a download speed of 1.3 Gbps during a demonstration of the ZTE 4.5G new technology. That's four times faster than 4G's maximum download speed. Telenet is the first in Europe to reach this speed in real-life circumstances. 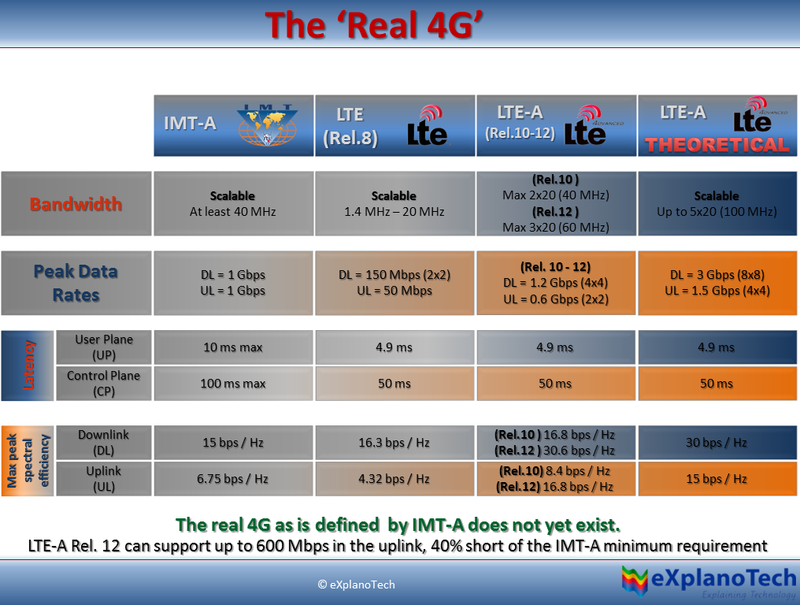 4.5G ZTE technology uses 4x4 MIMO beaming, 3-carrier aggregation, and a QAM 256 modulation. AT&T said, "The continued deployment of our 4G LTE-Advanced network remains essential to laying the foundation for our evolution to 5G. In fact, we expect to begin reaching peak theoretical speeds of up to 1 Gbps at some cell sites in 2017. We will continue to densify our wireless network this year through the deployment of small cells and the use of technologies like carrier aggregation, which increases peak data speeds. We’re currently deploying three-way carrier aggregation in select areas, and plan to introduce four-way carrier aggregation as well as LTE-License Assisted Access (LAA) this year." T-Mobile USA nearly reached a Gigabit and here is what they say, "we reached nearly 1 Gbps (979 Mbps) on our LTE network in our lab thanks to a combination of three carrier aggregation, 4x4 MIMO and 256 QAM (and an un-released handset)." So we are going to see a lot of higher speed LTE this year and yes we can call it Gigabit LTE but lets not forget that the criteria for a technology to be real '4G' was that it should be able to do 1Gbps in both DL and UL. Sadly, the UL part is still not going Gigabit anytime soon.